40 • RV PRO • September 2018 rv-pro.com R V M A N U F A C T U R E R S Built on a Dodge Ram 5500 platform, it comes standard as two-wheel drive with the option for four-wheel drive. "We've upgraded the interior, went to solid cherry cabinetry, and added a new driftwood and caramel, doing away with the early American cherry. We're solid wood now. It used to be wrap style," Anagnos says. "We also did a major cap change to be more automotive looking and more aerodynamic. The Uconnect stereo system comes in all the Ram products and customers really like that as well." The Force HD has added three new colors: Cabernet, Mag- netic and Admiral Blue. The interior received an upgrade as well, with shaker-style doors and cabinetry and solid cherry wood cabinets. The Truma AquaGo hot water heater and pre- mium vinyl floor throughout the entire coach come standard. The Force features a new floorplan, the 34 KD, which carries into the DX3 and Dynaquest XL, because Anagnos says people wanted a shorter floorplan. "Now the DX3 is our flagship coach we love," he says. "We've added a new floorplan, stayed with raised panel and cherry wood doors, as well as a five-panel raised-panel door, not the slab fronts, which is nice. There is tile throughout. That's new and standard for us. We switched to standard diesel Aqua-Hot versus propane. We've added a new color, magnetic, and all floorplans are multiplex lighting." 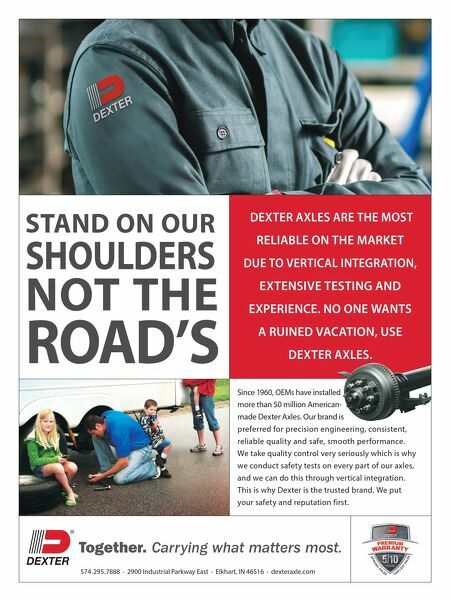 The Dynaquest XL now includes polished tile floors throughout, which was previously an upcharge. The interiors have been upgraded and include Corian countertops. All the products are upgraded with new bedspreads and headboards. A full-length awning has been added on the cab side as well as a third battery, the 4DHM battery. Anagnos says all products have moved to a Winegard 2.0 system, which has a Wi-Fi range extender on it. 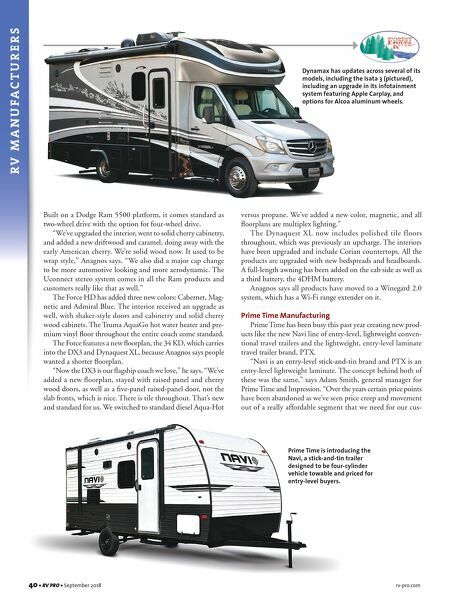 Prime Time Manufacturing Prime Time has been busy this past year creating new prod- ucts like the new Navi line of entry-level, lightweight conven- tional travel trailers and the lightweight, entry-level laminate travel trailer brand, PTX. "Navi is an entry-level stick-and-tin brand and PTX is an entry-level lightweight laminate. The concept behind both of these was the same," says Adam Smith, general manager for Prime Time and Impression. "Over the years certain price points have been abandoned as we've seen price creep and movement out of a really affordable segment that we need for our cus- Dynamax has updates across several of its models, including the Isata 3 (pictured), including an upgrade in its infotainment system featuring Apple Carplay, and options for Alcoa aluminum wheels. Prime Time is introducing the Navi, a stick-and-tin trailer designed to be four-cylinder vehicle towable and priced for entry-level buyers.